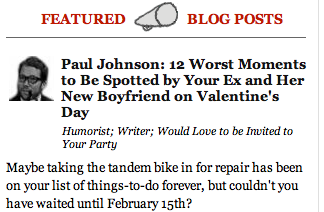 Paul Johnson's comedy blog: I didn't get into comedy to be rich or famous. All I've ever wanted was to be loved…by somebody rich and famous. I saw your job posting on USAJOBS seeking astronauts. Apparently many veteran astronauts are leaving and NASA will need upwards of fifty-five new astronauts in the next few years. Here’s my favorite part of the job description: “Frequent travel may be required.” I’m glad this detail was included before I applied because I had no idea a job traveling to space might require traveling. NASA–may I call you NASA? NASA, I wasn’t one of those kids who dreamed of becoming an astronaut, but I did dream about telling people I was an astronaut. And not just any people, but specifically the female half of people. 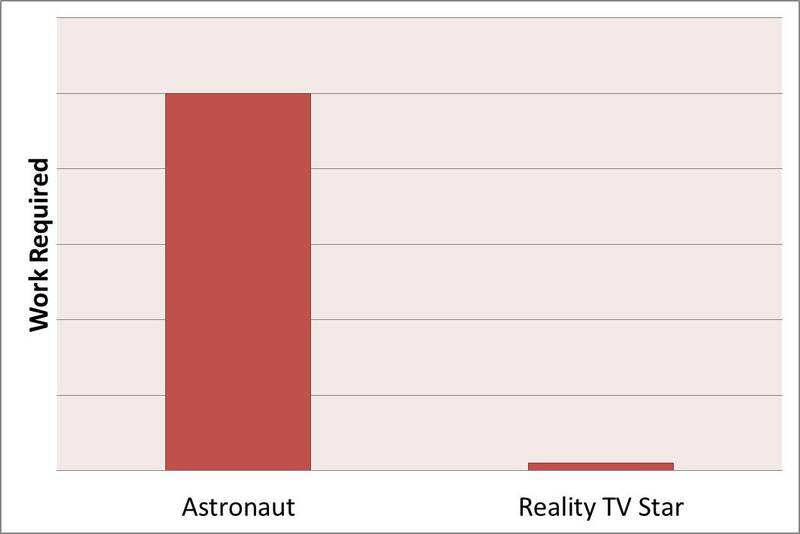 Here’s my suggestion: If you want to get young people excited about the space program again, why not develop a reality TV show based on selecting an astronaut to go up in space? Also, cut the math and science. ← Dear Good Greatsby: What’s on Your Bucket List? My sister once suggested that i became an engineer in order to find a husband. A man who was kinda nerdy and dorky enough to think i was hot. She suggested this, by the way, right before i threw her out of my house…. Something tells me the engineering type of man is even less attracted to the engineering type of woman. True that. Just because those nerdy dweebs can’t ever get a date doesn’t preclude them from being shallow. Hypocrites. Does reality tv involve travel, as well? It seems like TV could use the magic of blue screen technology to make space come to the astronauts. Thank you Greatsby, for pointing out and helping me realize how much has changed since I as a kid! LOLOL I actually worked with a woman who’s husband was an astronaut. His name was David Scott…. (don’t know if you remember him or not) he wasn’t one of the biggies or anything….but we all knew who he was and were SO impressed! Every time he came in to see her the whole office would just be in awe! “Did you see who was here”? “Yes, ‘I did!” “Isn’t he just so handsome”? It does seem like the astronauts selected are disproportionately handsome when compared to other men with advanced science degrees. All other qualifications being equal, being handsome doesn’t hurt. 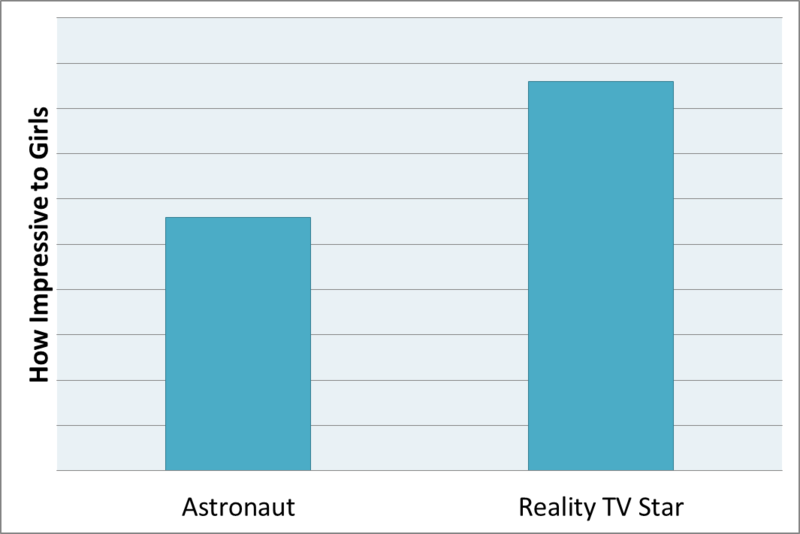 why not develop a reality TV show based on selecting an astronaut to go up in space? As a long time official and proud space cadet going all the way back to the Apollo program that I watched religiously as a kid that is a great idea. Of course something akin to what you described, if I remember correctly, happened several years ago. Some totally obsessed and married astronaut lady drove nonstop from Houston to the Kennedy Space Center in Florida to murder a rival astronaut lady who was making time with her male astronaut lover who I believe was also married. The dirty detail beyond the already complicated adultery situation involved her wearing a space diaper on her long drive so she did not have to stop for bathroom breaks. Nothing I know of beats that in the realm of reality television crazy. As for my space cadet dreams I may be forced to depend on the Chinese if I ever want to walk on the moon, those guys and gals have an up and coming program that will make NASA personnel green with envy. I grew up close to Edwards air force base in Calif. So I was friends with lots of air force brats….one of my best friends dad flew U-2 reconnaissance flts with Gary Powers (of course we didn’t know it then). Very exciting times, and we were all so impressed with it all! And yes, they were all quite handsome I suppose! LOL….much OLDER than me I might point out! NASA is in need of some PR help. “Astronaut” is so fifties. Try calling them something else: Star Troopers, Galaxy Gang, Planet Patrol, or let them all take on names similar to the X-Men and wear cool gear. Of course, also get rid of the math and science. I would much prefer telling women I’m with the Planet Control instead of being a boring astronaut. I can’t believe that men do not find female astronauts attractive. 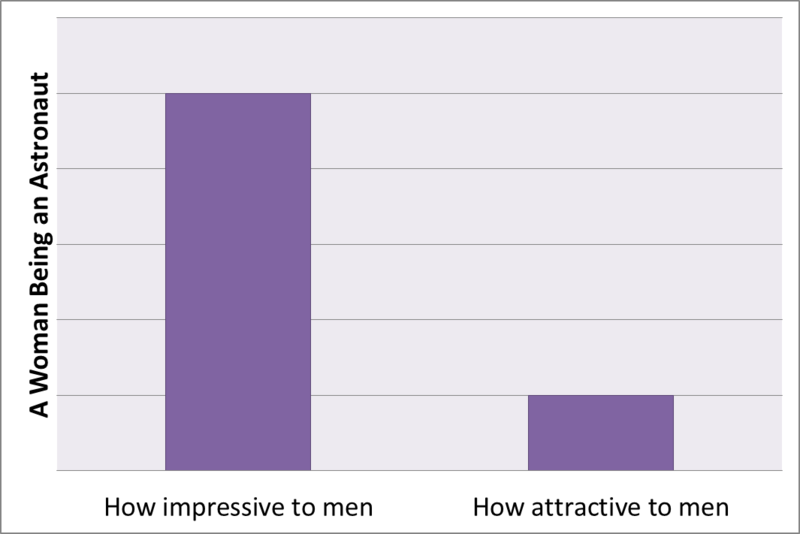 Do men like reality TV stars? If so, I think I need to re-think my life goals and start patterning my life after Snooki’s. I mean, men find her classy and attractive…right? I need more travel specifics. How far? Are we talking the moon or Mars? Will I get an endless supply of the astronaut freeze dried ice cream? I think NASA is actually considering sending people to Mars before long. No word on whether they plan to bring the people back. Tee hee! Made me laugh out loud. Poor NASA…come be an astronaut but don’t count on going anywhere soon. Sad. If they no longer require math and science, I’d say “one way trip” is a given. But do they have freeze dried cupcakes? Anyone wanna buy a slightly used space helmet??? A NASA space helmet or an alien space helmet? Great satire contains great truth. Love this! Oh, come on. Guys are totally into female astronauts. They don’t admit it, though, because they realize that female astronauts, being rocket scientists, after all, think they’re idiots. Intelligent women are plenty attractive until you get the feeling they think you’re a complete idiot. There’s something very unattractive about a person who realizes how dumb you are. I’m not sure if I could recognize any male reality (or female) stars except the guys from Top Gear (UK–I hear there’s a US version now), Shorty from that show with LPs and pitbulls and erm, oh. Ghost Hunters. I know those guys. I don’t know any astronauts (personally or to recognize on the street) but we had a chick astronaut speak at my big, fancy university commencement exercise. I forget her name but it was years before that broad with the diapers. You know what I mean. I think she was going to kill somebody but got caught wearing diapers and is now in prison. Or something. This is why I prefer ignorance. Oh, and the lady astronaut who spoke had her Masters or something from my school and she was bor-ing. I think NASA stopped using “chick astronaut” a few years ago, but I’m happy to help bring the term back. Love you data. I am certain that it was collected and derived scientifically. If we can adapt the idea to produce all reality shows in outer space. No one tell them it’s not being filmed and we can just send them on a one way trip. You could always be a fireman. Back in my day they were considered the “hot” profession. Up here in British Columbia, we didn’t see too many astronauts hanging around the bars. And I think the math and science component is way less. There’s that burning building thing though. The graphs are depressing, due to the accuracy. Still, I’m proud that I’m raising two pending engineers, created by a non-engineer and an engineer. Thank goodness I married a math and science man, as I am numerically challenged. My 6 yr old makes math worksheets for me. Yesterday, I asked if he could just create language worksheets for me, and math worksheets for Daddy. I’ve got one son convinced that he wants to be an engineer but the other son still needs more pressure before he’s ready to accept my dreams over his. My son is so good at math, he is doing it at 2 higher grade levels, whilst I am a math dummy. He is 6. However, he continues to assure me that he wants to be a Ninja when he grows up. Not sure how relevant math or science is to that profession, however. The graphs are impressive. I have to wonder how the readings would be affected if there were no such thing as alcohol? I did meet an astronaut once, and he hit on me. I was interested, ’till his friends told me he was a married spaceboy. I suddenly felt the need to go diaper shopping. Although some smart women like… ‘less smart’… guys. New pick up line: I’m not an astronaut, but I play one on tv. When is lumberjack going to come back in style? Lumberjack is actually a pretty funny profession to tell girls in a bar. I think that means it’s back in style now. Real World: Lunar Cave… I think it could work. But is there anyway to spray tan and stick a bikini on a chick in a space suit? That’s the first production note from the network to NASA: adapt spacesuits to show more skin. It’s probably the project manager in me talking, but I love a good set of bar charts. If you added “lead singer” to the first chart, you probably wouldn’t even be able to see the “astronaut” bar anymore. The part about travel required was priceless!! Are you sure there’s that much work required to be a Reality Star? Doesn’t it take a certain amount of work to be the type of difficult person who can’t get along with anyone and makes for an interesting reality show character? Haha! Does it? I’ve known people who were like that with absolutely no effort whatsoever. I’ve always assumed it was easier to be nice. It’s no fun to be a mean person and it’s exhausting to carry all that negative energy around all day. 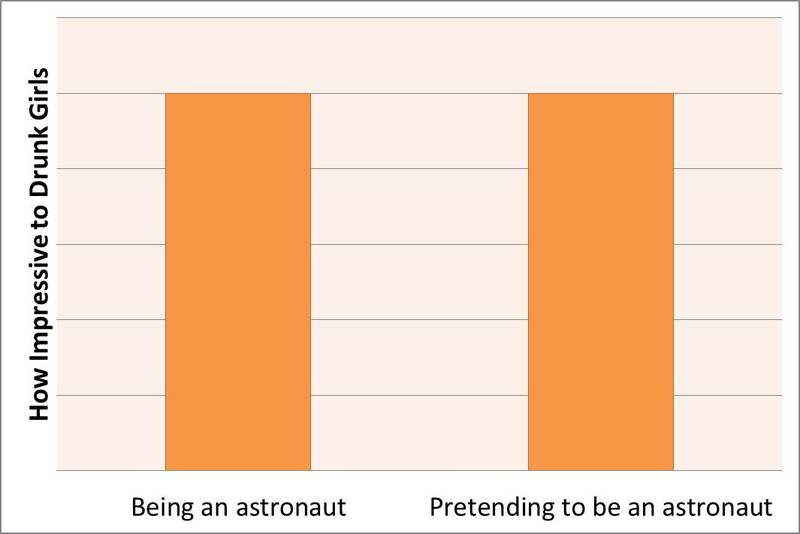 I don’t see why it has to be so hard to be an astronaut. All you have to do is press blinking buttons, float around without bumping into more essential buttons (like EJECT), and poop into a plastic bag or something. One of my classmates (well, she graduated the same year that I did, although I didn’t know her) from college is an astronaut. So I get to feel inadequate several times a year when I get “Cady just left for another trip to the ISS! Send in your news!” mail from the alumni association. I don’t even know Cady and I already hate her. I am impressed you have such detailed graphs..everyone knows graphs don’t lie! I even have a graph about how graphs don’t lie. These graphs are pretty impressive and highly accurate. Nice job. I wonder if you could ever diagram a man’s brain for me so that I would really know what the hell’s going on in there (if anything?) When I tried it, all the men told me it was all wrong. A reality TV show based on the selection process of astronauts? Wait a minute, I thought we did away with the space program? What the heck is NASA doing spending our tax dollars on new astronauts? They should be advertising for mechanics who speak Russian, and are prepared to fix stuff that breaks down while hitching a ride up to the space station. I was traveling this week (not in outer space) so I’m late to comment. Another good way for NASA to attract would-be astronauts is to continue funding travel into space, but apparently congress doesn’t see it that way and is proposing cuts to the space program. Thank You for Inviting Me to the Party. I Apologize for My Behavior at the Party. © 2011-2018 TheGoodGreatsby, All Rights Reserved.